I'd made arrangements for a pre-dawn run, so I was up early to the cat alarm. Curtis takes his alarm duties very seriously, and is very polite and genteel about it. At first. Then I was downstairs writing for a bit because it was still early. (Did you see yesterday's snippet?) Behind me was a noise all cat owners know. I had just settled myself into the chair with the heated and vibrating thingies, and had to leap up before they started licking it up. I'm just glad they didn't hit the snowshoes that had to be returned today. After lots of limbering up, checking the weather page, and dressing carefully, I headed out. I'd overdressed yesterday, so wore less. After all it was only -16 C, not quite zero F. Not quite dawn. 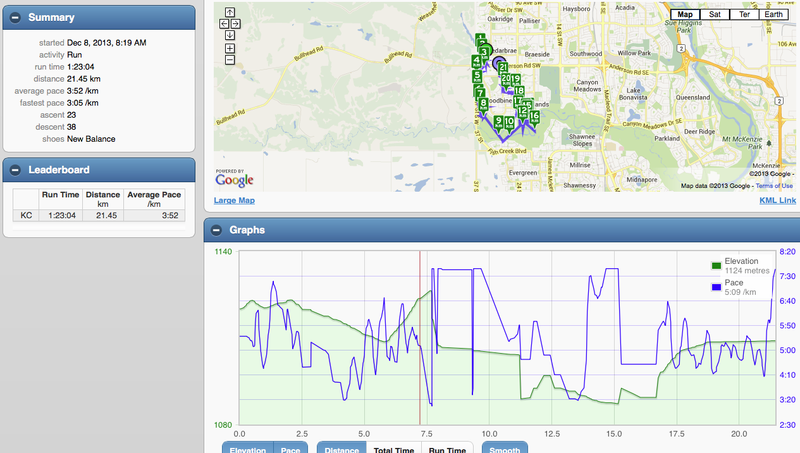 The idea was to run toward the reservoir to meet up with Michelle, then run down to Fish Creek. My RunMeter was all over the place. I reset it once, but that didn't do any good. I like the numbers they produced, although they are totally, wildly wrong. 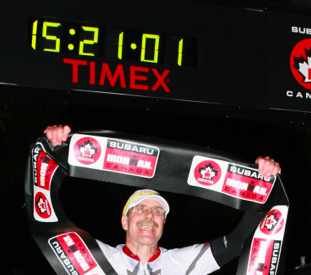 I know I did not run a half marathon in 1:23. 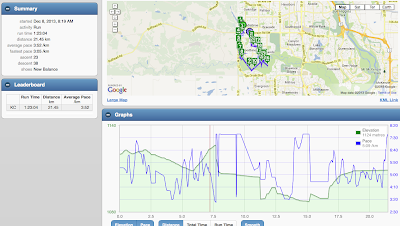 This first one is the small map, that does not give full justice to what we ran. I just love the blue pace line. 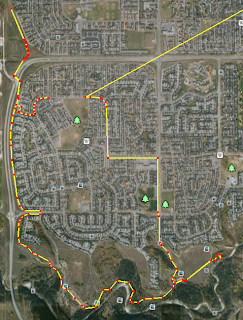 Here's the run map blown up a bit. 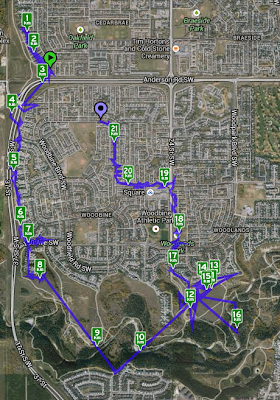 In fact, after carefully plotting in Google Earth, I ran a hair over 11 K, in about 1:23 or so. That's about a 7:27 pace, and we stopped once for a selfie and twice for a hug. 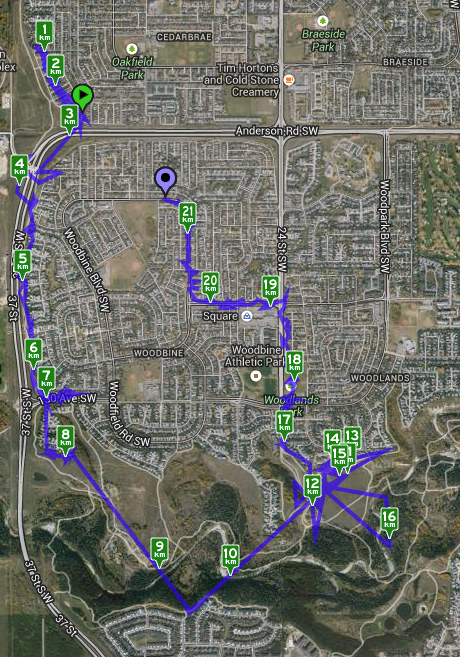 Plus some walking bits around the path detour. Ignore that straight bit heading up and to the right. That's an artifact of trying to keep Google Earth from scrolling to outer space. 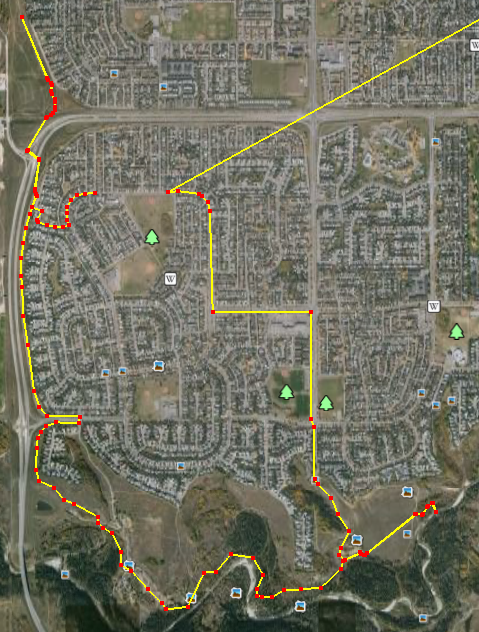 Michelle kept going and if I read that tweet right got through her 32 K run with no further adventure. Here's the promised tusk selfie. One of these is not like the other. We had a really nice chatty run. It was cool, of course, and snowing lightly. My legs behaved themselves. My theory is that I need to limber up better, and spend a bit more time getting ready to run. Maybe I'm running too fast. Linda had coffee ready for me. Nice! After some coffee, treats, a shower, more treats, I napped a bit. 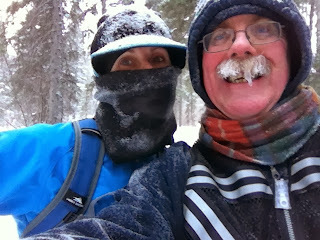 Then headed out to return the snowshoes. I had somehow bent the plate that the boots get strapped to. While my feet were strapped in. I have no idea how I did that, and didn't break anything of mine. MEC was good about the exchange, though the clerk was mildly amazed. The big thrill of the day was waiting to get out of the parking lot. I'm just sitting there, and the car to my right gets put in reverse, and starts heading for me. I'm frantically beeping the horn, waiting to get crunched. It stopped just in time. I left before they could take another run at me. And good news for fans of Big D's at the Calgary Market! It's open again, and the line up was around the corner. I'm not sure who's running it now, but it smells as good as ever. Oh, and this is post 1600 overall. A few more and I'll break my record for most posts in a year. Last thing, don't for get the AMA! Ask Me Anything and I will answer. Leave your questions in comments, email, or social media. If you don't leave a question, I might make up one and attribute it to you.